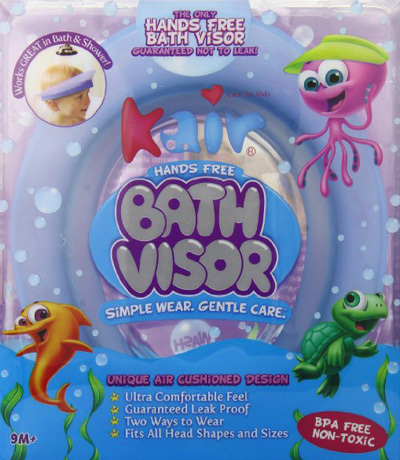 Bath toys serve a lot of different purposes when it comes to stimulating the imagination and creativity of your child during bath time, but did you know that there are some bath toys out there designed to serve a practical purpose for us as parents as well? This bath toy thermometer from Ozeri, adorably called the Turtlemeter, is the #1 best selling bath thermometer this year and features a color-coded LCD screen that gives you a quick indication of the water in addition to the exact temperature. 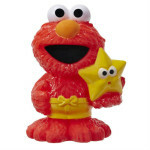 That’s where cute baby bath thermometers come in. 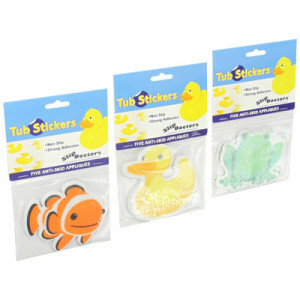 They are thermometers that tell you the temperature of the bath water at all times so you can gauge whether the water is too hot or cold for your child, while doubling as an adorable floating bath toy for your child when they are ready to get into the perfectly temperate bath. 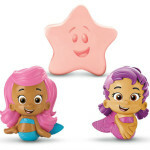 We’ve compiled a short list of the cutest baby bath thermometers for you here, to hopefully aid you in finding the right one for your child. In addition to their cuteness factor though, there are a couple of other considerations to take in mind when shopping for the best bath thermometer. For one, there are several different varieties of temperature displays. Some show the temperature in very small numbers, while others have larger numbers. My favorite have large numbers and a color display that will illuminate blue when the water is too cold, red when it is too hot, and green when it is just right. They make it very easy to know if the temperature is in a dangerous extreme zone with just a quick glance. 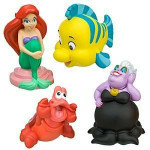 Furthermore, these are battery-powered water devices, so it’s important to find ones that are designed such that water is not going to get into the battery compartment. We’d also like to find the ones that have the best track record for longevity, as some baby bath thermometers tend to break within weeks or months. The wisdom of the crowds is a great resource here, as we can utilize hundreds of customer reviews to have a strong idea of which thermometer is going to last the longest for us. Below we’ve compiled a comparison chart of the top-rated and cutest baby bath thermometers of 2019. Below that we’ve gone into further detail of our favorites, elaborating on their features and how well they’ve held up for other parents. Hopefully the comparison chart above has given you a few ideas about which baby bath thermometer is right for you. If you’re still undecided, read on and we will explore some of the top-rated cute thermometers in even more detail below. 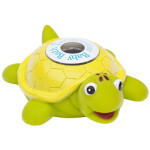 This floating turtle bath tub thermometer from Ozer, adorably called the “Turtlemeter,” is the best selling bath tub thermometer of 2019, and it’s not hard to see why. The turtle itself is extremely cute, with a big smile, freckles on the top of his head, and alert, happy eyes. 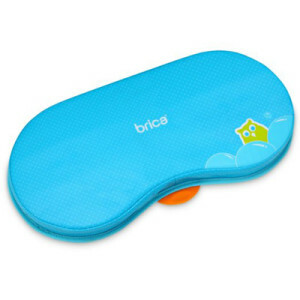 But besides being a great toy that this child is sure to enjoy, it also has the ideal temperature gauge, with large numbers and a colored LCD indicator that lights up blue, red, or green depending on if the water is too cold, too hot, or just right. The Turtlemeter activates automatically upon contact with water and checks the temperature every second. 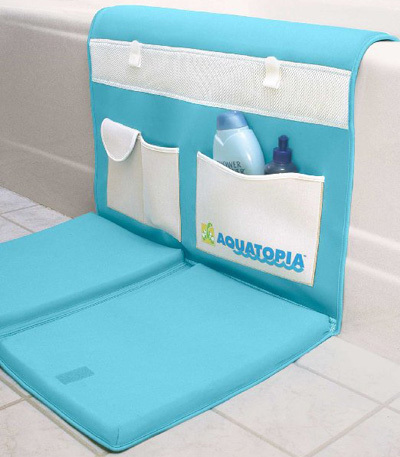 The product comes with 3 AAA batteries included, and unlike some other baby bath thermometers the battery compartment is actually easily accessible with screws at the bottom for replacing the batteries. That helps with the longevity of the product, and the water-tightness of the battery compartment does not seem to be an issue from consumers, with reviewers not mentioning it. Just make sure not to over-tighten the screws if you do replace the batteries down the line, as that can always crack plastic. Some customers have experienced the Turtlemeter not lasting for very long, but with an average rating of 4.2 stars, those ones certainly seem to be the exception and the Turtlemeter still seems to us to be the best baby bath tub thermometer on the market today. 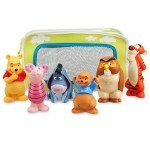 See full product reviews and prices on Amazon. Skip Hob is a very popular and great brand in the baby bath accessories space, with their Moby whale-design line being among the cutest bath products out there. 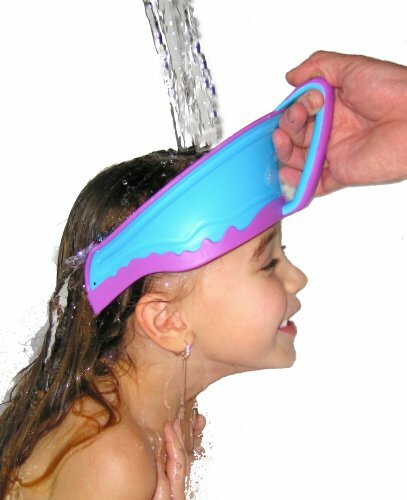 And thankfully, they also make a Skip Hob Moby bath thermometer as well! 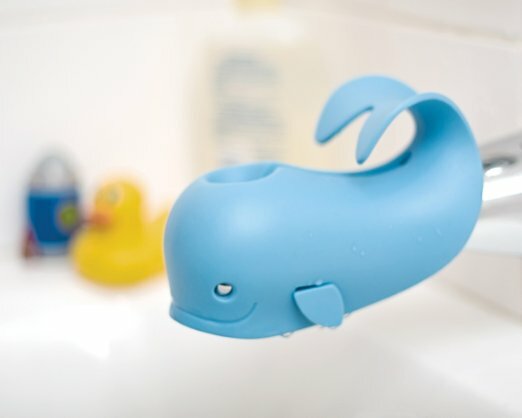 The whale thermometer is also a super cute floating toy, and comes with a suction cup on its bottom to help you store it when it’s not in use. 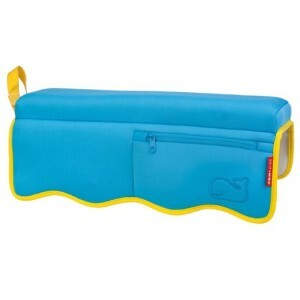 In typical Skip Hop Moby-design style, when suctioned to the wall the whale’s tail serves as a wash cloth hook! While this Skip Hop thermometer has the great color-coded indicator feature that lights up blue, green, or red depending on the range of the temperature reading, the actual numbers for the temperature reading are a little on the small side. But that’s less important if you can easily see the color indication quickly. The Skip Hob Moby thermometer uses a smaller lithium coin battery, CR2032 , and like the Turtlemeter’s it is also replaceable. 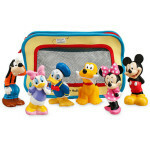 The battery is included and is designed to last for about 6 months from first use. Some customers have reported it lasting a little shorter, some a little longer, but the coin batteries are cheap to replace. Similar to the Ozeri bath tub thermometers, this one from Skip Hop is of high quality. There aren’t complaints about water leaking into the battery compartment, and at a 4.0-star rating it tends to hold up relatively well. The Duckymeter comes with all the same great features as the Turtlemeter, including activating automatically upon contact with water, a 3-color LCD temperature indicator, and an easy-to-access compartment for replaceable batteries. 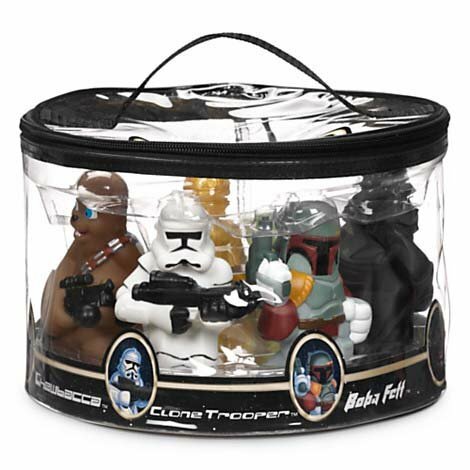 It also comes ready to use with 3 AAA batteries, so all you have to do to get it working on its first use is take it out of the packaging and drop it into the water. 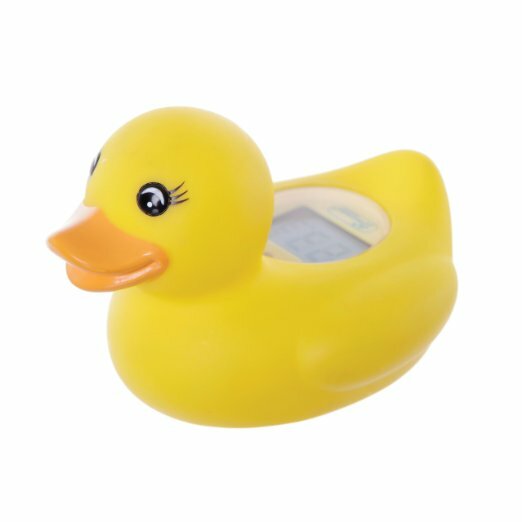 With how large and well-made the temperature indicator is on the Ozeri thermometers, they are definitely a top choice for baby bath thermometers, and this design doubles as an adorable rubber ducky bath toy at the same time. With a 4.0-star average customer rating, it’s definitely a top contender as well.